Yo, insert hook in st, yo, pull through st and first lp on hook as though to sl st, yo, pull through 2 lps on hook. Yo, insert hook in st, yo, pull through st and first lp on hook as though to sl st, insert hook in next st, yo, pull through st, yo, pull through 4 lps on hook. Chain 4 picot (ch 4 picot): Ch 4, sl st in top of st made just below the picot. 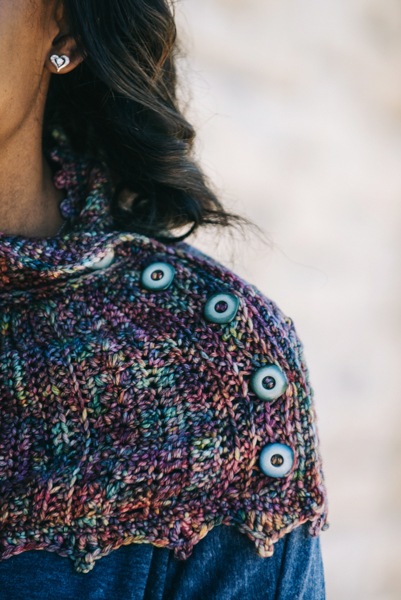 Cowl is worked vertically across from one side of button band to next side of buttonhole band. 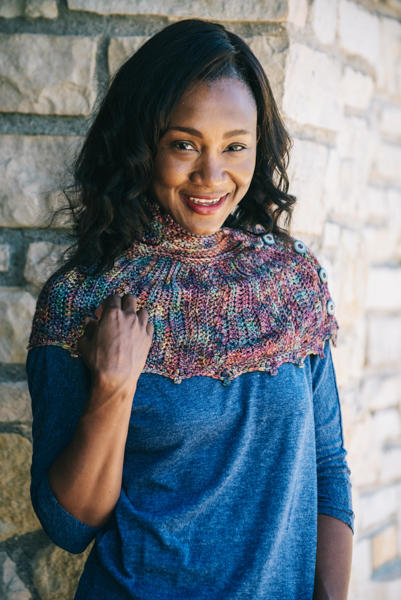 Upper neck band is worked across horizontally and finished with picot edge. Work lower edge horizontally and finish along bottom trim. 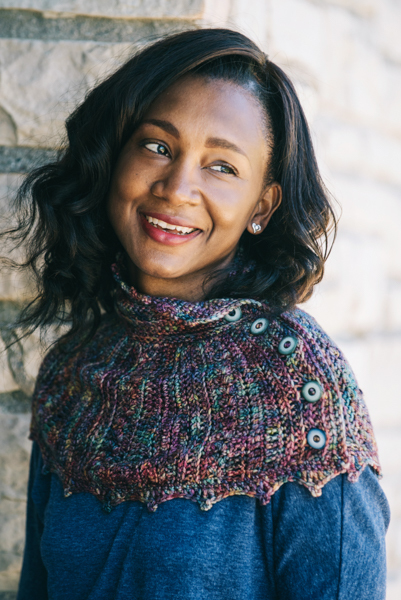 All even numbered rows are the right side of the cowl. Row 1: Working in back hump of ch, sc in 2nd ch from hook and in each ch across – 28 sc. Row 2 (RS): Ch 1, turn, work hbhdc, in blo of each sc across – 28 hbhdc. Row 3: Ch 1, turn, work hbhdc in flo of each st across – 28 hbhdc. Row 4: Ch 1, turn, work hbhdc in blo of each st across. Row 5: Ch I, turn, sk first st, *(sc, dc) in next st, sk next st; rep from * across, ending with (sc, dc) in last st – 28 sts. Row 6: Ch 1, turn, work through both lps in each st, sk first dc, *(sc, dc) in next sc, sk next dc; rep from * across – 28 sts. Row 7: Ch 1, turn, work through both lps in each st, tr in next 7 sts, dc in next 7 sts, hdc in next 7 sts, sc in last 7 sts – 7 tr, 7 dc, 7 hdc, 7 sc. Row 8: Ch 1, turn, work through both lps in each st, sc in next 7 sts, hdc in next 7 sts, dc in next 7 sts, tr in last 7 sts – 7 sc, 7 hdc, 7 dc, 7 tr. Row 10: Ch 1, turn, sl st in next 7 sts, sc in next 7 sts, hbhdc in last 14 sts. Row 11: Ch 1, turn, work through both lps of each st, hbhdc in next 14 sts, sc in next 7sts, sl st in last 7 sts – 28 sts. Rows 12-13: Rep Rows 10-11. Row 14: Ch 1, turn, work through both lps, hbhdc in each st across – 28 sts. Rows 15-16: Rep Rows 3-4. Row 18: Rep Row 5. Row 19: Rep Row 6. Rows 21-22: Rep Rows 7-8. Row 23: Rep Row 11. Row 24: Rep Row 10. Rows 25-28: Rep Rows 5-8. Row 29: Rep row 7. Rows 30-31: Rep Row 10-11. Rows 32-39: Rep Rows 18-25. Rows 40-44: Rep Rows 28-32. Rows 45-46: Rep Rows 7-8. Row 47: Rep Row 7. Rows 48-51: Rep Rows 10-11. Row 52: Rep Row 14. Rows 53-56: Rep Rows 3-6. Rows 57-64: Rep Rows 45-52. Rows 65-66: Rep Rows 7-8. Row 67: Rep Row 11. Row 68: Rep Row 10. Rows 69-76: Rep Rows 45-52. Rows 77-80: Rep Rows 3-6. Rows 81-82: Rep Row 7-8. Row 83: Rep Row 7. Row 84: Rep Row 14. Row 85 (Buttonhole Band): Ch 1, turn, working in flo of each st, hbhdc in next 3 sts, ch 1, sk next st, *hbhdc in next 6 sts, ch 1, sk next st; rep from * across to last 3 sts, hbhdc in last 3 sts – 4 ch-1 sps for buttonholes, 24 hbhdc. Row 86: Ch 1, turn, working in blo, hbhdc in each st and ch-1 sp across – 28 hbhdc. Row 87: Rep Row 3. 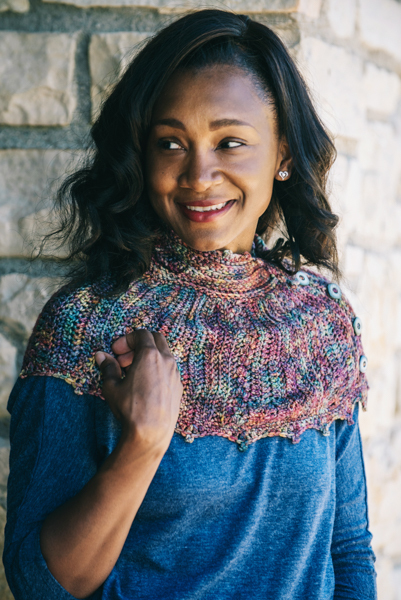 Row 1: Ch 1, turn, work 80 sc evenly across upper collar of Cowl across to next corner. Row 2 (RS): Ch 1, turn, *sc in next 8 sts, sc2tog in next 2 sc; rep from * across to end – 73 sc. Row 3: Ch 1, turn, working in flo, sc in next 3 sts, sc2tog in next 2 sts, *sc in next 6 sts, sc2tog in next 2 sts; rep from * across, ending with sc in last 4 sts – 64 sc. Row 4: Ch 1, turn, working in blo, sc in each st across. Row 6: Ch 1, turn, working in both lps, hbhdc in next 3 sts, sk next st, ch 1, hbhdc in each st across – 63 hbhdc, 1 ch-1 sp. Row 7: Ch 1, turn, working through both lps, hbhdc in each st and ch-1 sp across – 64 hbhdc. Row 8: Ch 1, turn, working in blo, hbhdc in next 31 sts, hbhdc2tog in next 2 sts, hbhdc in next 31 sts – 63 hbhdc. Rnd 1: Ch 1, turn, work 3 sc in corner st, place stitch marker in center sc in corner, work 8 sc evenly across short edge of collar down to beginning portion of main body, work 28 sc along short edge of main body to bottom corner of cowl, work 2 more sc in corner, work 125 sc evenly across bottom edge to the next corner, work 2 more sc in corner st, work 28 sc up short edge of main body to beg row of collar, work 8 sc evenly across short edge of collar to upper most corner, work 2 more sc in corner st, work sc in each st across to stitch marker – 268 sc. 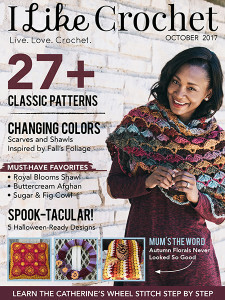 With RS facing, ch 1, turn, *sc in next 3 sts, ch 4 picot; rep from * across, ending with sc in last 3 sts, work 2 more sc in corner st.
Work 40 sc down short edge of cowl along button band to bottom corner, work 2 more sc in corner st, turn to work along 125 sts on bottom edge, hdc in next st, dc in next st, (tr, ch 4, tr) in next st, dc in next st, hdc in next st, sc in next st, *sc in next st, hdc in next st, dc in next st, (tr, ch 4, tr) in next st, dc in next st, hdc in next st, sc in next st; rep from * across to next corner. Hand wash in tepid water and block. 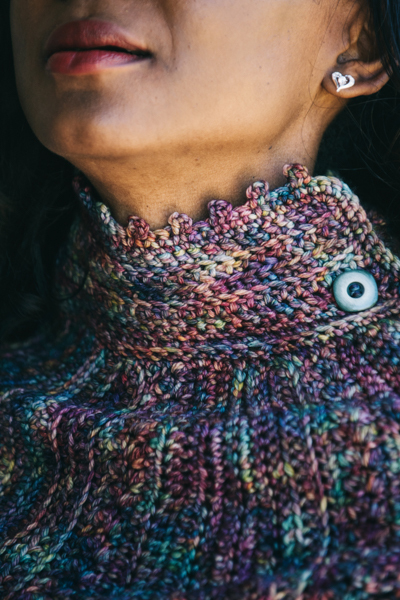 Align button band with buttonhole band and mark placement of 5 buttons from collar to bottom edge of cowl. Sew buttons in place.